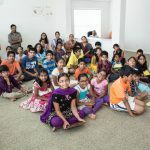 “Four days went by like two hours!” said one of the kids who attended the Houston Gopa Kuteeram Summer Camp 2010; and indeed the four-day camp went by in a flash as the kids were engaged constantly in activities geared towards enhancing their appreciation of Bhagavata Dharma. The camp, which was held at the Houston Namadwaar from Aug 5-8, saw participation from about 15 kids ranging in age from 3 to 13 years. 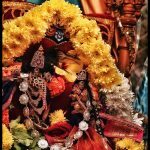 The daily schedule began with prabhodhanam (waking up the Lord) and ended with dolotsavam (lulling the Lord to sleep). Prabhodhanam was followed daily by yoga and Nama sankirtan at Namadwaar. This was followed by different activities on different days including a group discussion on G.E.T. (Grace, Effort, Time) and how to obtain the Grace of God, and a Srimad Bhagavatam project where the kids worked on creating two posters—one on the Bhagavatam lineage and the importance of Bhagavatam, and the other on Prahlada Charitram. The younger participants (ages 3 to 6) spent time in craftwork everyday. Their handiwork included making a mango leaf & flower thoranam, a peacock and decorative wall hangings of the Rama Nama and the Mahamantra. Lunchtime was followed by game sessions that included a numbers trading game that explained the significance of various numbers in our dharma, dumb charades, hot-cold, a blindfold game and more. The kids also spent the afternoons preparing for a “contemporary Hari katha” presentation. The participants were divided into three groups, and each of the groups learned kirtans and dialogues on one of the following topics—Guru Mahima, Nama Mahima and Krishna Lila. Each day of the camp had a special highlight session. On the first day, the kids were taken on a field trip to the Houston Museum of Fine Arts which hosts an Arts of India gallery that houses age-old sculptures, pieces of art, ornaments and instruments from ancient India. On the second day, a special, live Q & A session was arranged for the kids with Sri Ramanajumji over the telephone. Youngsters aged 8 to 13 years asked several interesting questions ranging from “Did God make the sun?” and “Which God punishes us?” to “How long should I pray before I will be able to see God?”, “What happens to the soul after the body dies?” and “What if a virtuous and pious man dies before attaining Mukti. Are all his efforts a waste?” The questions elicited lucid answers from Sri Ramanujamji, filled with kid-appropriate examples to enable them to grasp the answers easily. Later that day, as suggested by Sri Ramanujamji, the kids wrote a “gratitude log”—a list of all that they are thankful to God for. Sri Ramanujamji said during the Q&A session that making a regular habit of maintaining a gratitude log makes children more positive by nature, as has even been proved scientifically. Starting the habit early can go a long way because even in the corporate world, the traits that separate the best from the rest are positive thinking and optimism. With this premise in mind, the children were encouraged to start writing their gratitude logs on a regular basis. The third day was another exciting one. Towards the evening, the kids were taken to a nearby community swimming pool for an hour of splashing fun. The best part of this session was the enactment of the Amrutha mathanam (Churning of the Milky Ocean/Kurma Avatar) episode that is related in Canto 9 of Srimad Bhagavatam. Using props that included a turtle (Kurma) float, a balloon (the Mandara mountain), a rope that stood in for Vasuki the king of snakes, as well as animal toys, the “devas” and “asuras” had a great time churning the ocean. The things that arose from the children’s ocean included the halahala poison that was consumed by Lord Shiva, the seven-headed horse Ucchaishravas, the white elephant Airavata, the Kalpataru tree, Lakshmi Devi who garlanded Lord Narayana, and finally Dhanvantari carrying the amrutha (nectar of immortality). As the asuras snatched the nectar away, Lord Narayana took the Mohini avatar and saved the day by serving the amrutha to the devas. The kids had immense fun enacting this whole episode in the pool. The fourth and final day saw the kids participate in a Nagara sankirtan at Houston’s famous Sri Meenakshi Temple, in the morning. 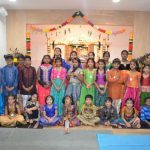 The children walked around the temple prakaram chanting the Mahamantra, and also spent a few minutes chanting at each deity’s sannidhi in the prakaram. Finally the “procession” filed into the main sanctum sanctorum and chanted the Mahamantra in front of Mother Meenakshi, Lord Shiva and Lord Srinivasa Perumal. In the afternoon, the children welcomed their parents for an end-of-camp presentation to showcase all that they had learned during the four days. First, five of the participants—Adith, Vyas, Vishnu, Vishnupriya and Shravya—shared what they had enjoyed most in the camp. Then the kids divided into two groups and presented what they had depicted in their Bhagavatam posters, with each of them taking turns to explain a part of the poster. Then a “surprise” parents vs. children quiz was conducted where the kids beat their parents hands down (despite some heart-stopping moments when the parents gave the kids a run for their money). Finally the children performed the “contemporary” Hari kathas that they had been preparing for. Each of the groups sang beautifully, rendering Sri Sri Muralidhara Swamiji’s kirtans and one kirtan by Sri Vallabhacharya, interspersed with dialogues explaining the theme of the group and the meaning of the kirtans. Vishnu and Karun accompanied the singers on the mridangam. Certificates and prizes were then given away to all the participants. 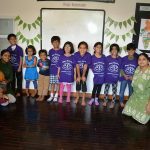 Adith and Vishnupriya were adjudged the Gopa and Gopi of the camp respectively, and Vishnu won the prize for the Best Performer during Gametime. Shilpa then rendered a beautiful, haunting Meera bhajan that transported the listeners to another world. The program finally concluded with chanting and arati at the Namadwaar, with excitement and satisfaction in the air, and promises for more such camps in the future.